Your vehicle's axle, CV joint, and driveshaft components are integral to the performance and drivability of your vehicle. The driveshaft is a steel or aluminum cylindrical component that connects the transmission to the rear differential. The driveshaft connects to the transmission through the CV joints, which are responsible for transferring the torque from the transmission to the drive wheels at a constant speed. Front wheel drive vehicles use CV joints on the front axles. CV joints allow the axle to bend and change while accommodating the bounce of the wheels. The axle bears the weight of the vehicle while also being strong enough to sustain the forces from braking and accelerating. Over time and through normal use, your vehicle's axle, CV joint, and driveshaft components may require maintenance or replacement services. We repair and balance drive shafts and we replace U-Joints. Our driveshaft work done by master technicians is backed with our three year 100,000 mile parts and labor warranty. There are signs to look for when determining when to schedule an inspection of your vehicle's front axle, rear axle, CV joints, and driveshaft components. Clunking or clicking noises are signs that a CV joint needs replacement. Vibrations during acceleration may indicate a damaged driveshaft, though they may also point to an axle issue depending on the layout of your vehicle. Turning and steering issues may also arise out of a problem with the driveshaft. CV joints can go bad when the grease leaks out of a damaged CV boot. There are various determinants for how quickly your vehicle's axle, CV joint, and driveshaft components will degrade over time. 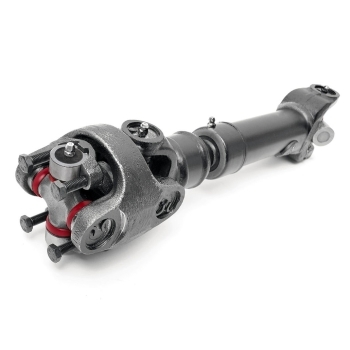 If you would like to learn more about the intervals between repairs for front wheel drive axles, main driveshafts, CV joints, U-joints, yokes, and other axle assembly components, then contact us today.